According to numerous reports, quoting an Israel Foreign Ministry cable sent by an Israeli Consulate official in NY, during a meeting on March 27, 2018 with Jewish leaders in New York, Saudi Arabian Prince Mohammed bin Salman (MbS), had harsh words for PA Chairman Mahmoud Abbas (Abu Mazen). The Times of Israel states the prince “castigated” Abbas and other sources add, MbS stated the PA have consistently missed opportunities over the past decades, and the time has come to accept the current US administration offer for peace or “shut up”. The closed-door meeting with the heads of Jewish organizations in NYC has led to a new reality, with MbS explaining the PA (Palestinian Authority) diplomatic process is far from a major concern for Saudi Arabia, adding they are far more concerned with preventing the growing Iranian influence in the area. It is no secret that Abbas, and Arafat YM”S before him, rejected offers from many an Israeli Prime Minister, from Yitzchak Rabin, Ehud Barak, Ehud Olmert, Arik Sharon and Binyamin Netanyahu. It has become clear to all that Abbas is genuinely interested in perpetuating the conflict and playing the underdog, as the nations of the world continue pouring countless sums of money into the PA and Hamastine, Gaza. With the establishment of the current US administration, headed by President Donald Trump, the tables have turned and it appears the White House and State Department are no longer biased against Israel as was the case with previous administrations. The so-called Mideast peace process has been placed on a low burner as the White House prefers to concentrate on “making America great again”. MbS told Jewish leaders that Abu Mazen should accept the plan that was prepared by the current US administration, which according to reports is ready to be released, or “simply shut up”, signaling even the moderate Arab world has become tired of the PA whining. The White House plan was drawn up by President Trumps closest advisor, Jared Kushner. An Israel 10 News report on the March 27th meeting did not mention the names of the Jewish leaders present, just that they were representative of major organizations. 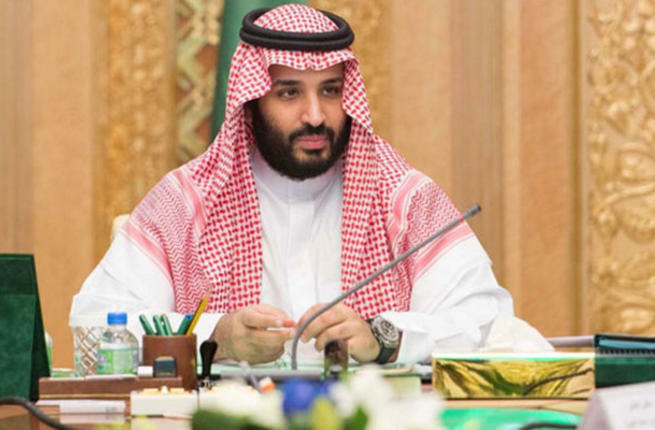 The Saudi Embassy said that the crown prince was to have met with Jewish leaders including Rabbi Rick Jacobs (President of the Union for Reform Judaism); Rabbi Steven Wernick (head of the United Synagogue of Conservative Judaism); and Allen Fagin (Executive Vice President of the Orthodox Union). That meeting, however, which also included Christian leaders, took place on March 28, the Times of Israel adds. The New York Times and Reuters of late have both reported Saudi Arabia has been applying pressure on Ramallah to accept the US plan, but for now, there is no signal that this will occur since Abbas announced he is boycotting the White House since President Trump has become impartial, shifting away from the one-sided policies of President Barak Obama.